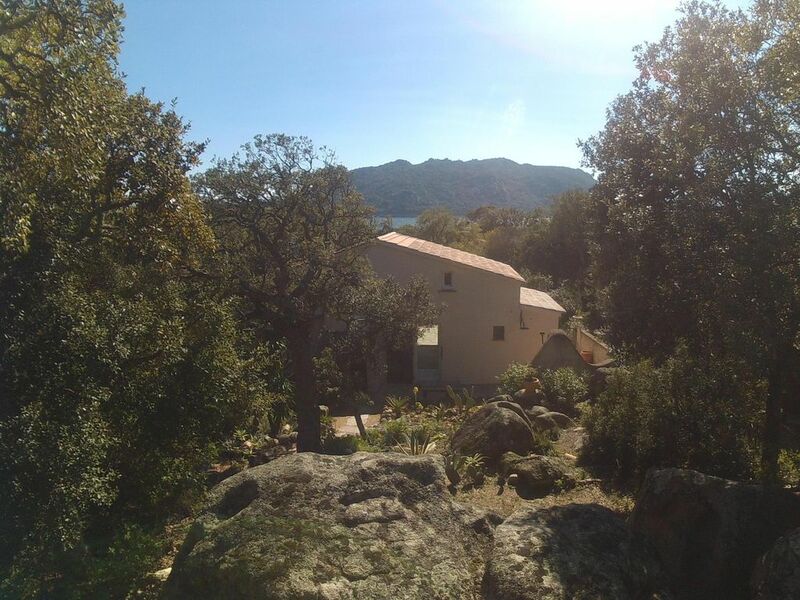 Situated in the "maquis", very quiet , The bungalow is placed in the village named "Les Hameaux de Pietragione" in a 10 htc park where you'll find corkoaks and the flora typical of of the island: "maquis". Every comfort, big garden (100 m2) with barbecue and external shower. The house is completely equipped, the veranda can be quickly equipped with with long chairs, table and chairs for relaxing or dining. The house is equipped with electrical radiators. A perfect relax for individuals and families. Wireless internet connection is available at the reception (Accueil) at 2 euros/hour. "The accomodation is nice. Specially the outdoor is usefull and calm. THe only thing that bother us was the soft beds. We will come back." Un logement idéalement situé a quelques pas d'une magnifique plage ! Rien a dire nous avons passé un super séjour ! Très joli logement,bien équipé et décoré avec soin.Propre.Jardin bien arboré.On a l'impression d'être seuls au milieu de la végétation et des rochers!Terrasse agréable.Belle plage de Santa Guilia à quelques dizaines de mètres,très pratique.Nous avons adoré notre séjour dans cette maison et nous y retournerons sans doute avec grand plaisir!La propriétaire est vraiment sympathique et répond rapidement au message.En résumé:location et localisation parfaites! The beautiful little house is tidy, clean and comfortable. It is surrounded by a flowery park where a gardener works all day long. You have all you need inside the house and even more, taking into account that Santa Giulia' s bay is at two minutes' walk from the house and you spend most of the time at the beach. Moreover, the owner is kind and ready to help. Sono molto contenta della recensione, in effetti il posto e' magnifico e il mio alloggio piace molto. Spero che piaccia a tutti nello stesso modo. Sono anche contenta di aver trovato famiglie educate e rispettose. Wir haben uns in diesem Haus sehr wohlgefühlt. Es ist mit Allem ausgestattet was man für einen angenehmen Aufenthalt benötigt. Eine große überdachte Terrasse stand auch zur Verfügung. Der Strand war nur ca. 3 Minuten entfernt. Ho soggiornato presso il bungalow Bonifacio a Les Hameaux de Pietragione dal 19/08 al 02/09/2017. L' abitazione gode di una posizione privilegiata rispetto alla spiaggia e consente di avere una totale privacy rispetto agli altri bungalow circostanti. E' stato ristrutturato recentemente con cura e buon gusto ed è dotato di tutti confort. La pulizia trovata è stata impeccabile e la disponibilità della signora che consegna le chiavi totale. E' sicuramente consigliabile per una vacanza comoda e rilassante. By air from Nice (France) to Figari Airport 30 km. to the mini-villa By sea from Genoa (Italy) to Bastia (Nord - Corse)by Moby Lines ferry boat, very Comfortable 4.5 hours trip, then 160 km. by car (about 2 hours trip) or by Savona-Vado (Italy) by Corsica Ferries ferry Boat , the last also by night traveling with arriving in Bastia around 7 am. The sand of the beach is white and thin. The sea water is turquoise-blue and pink rocks emerge from the water.The sea bottom is not deep and slopes lightly, the perfect place for children; farer away the water becomes deeper allowing swimming and snorkeling. Inside the village there is a tennis court and a shelter for storing wind-surf boards. Plenty of nautical activities along the bay. You can rich the "piazzetta" by a short walk where there are some shops. Many restaurant and "Pizzerias" all along the bay. In Porto-Vecchio the evening offers many entertainments: the Church Place with its cafés,disco and shopping. Two golf courts: 3 km from the village LEZZA and near Bonifacio (25 km) the famous SPERONE GOLF CLUB in the wonderful frame of the "Bocche di Bonifacio". If you love mountains you can reach in a half an hour drive "Foresta dell'Ospedale" where you can relax in the freshness of old elms where is possible fishing in the lake or having trips and taste all Corsican traditional recipes an the restaurants. You can continue up to Zonza and to Bavella Massif, from there you can reach Solenzara by another route and nearby have a dinner with oysters at Urbino or Diana waterhole where are cultivated. Of course you can visit the most famous bays of southern Corsica: Palombaggia, Santa Giulia, San Cipriano, Rondinara, Cala Longa, Sant'Amanza etc. Try a vacation in this wondereful land,the "Island of beauty" named by old Greeks "Kalliste" that means "The most beautiful". Have a wonderful and enjoyable vacation.